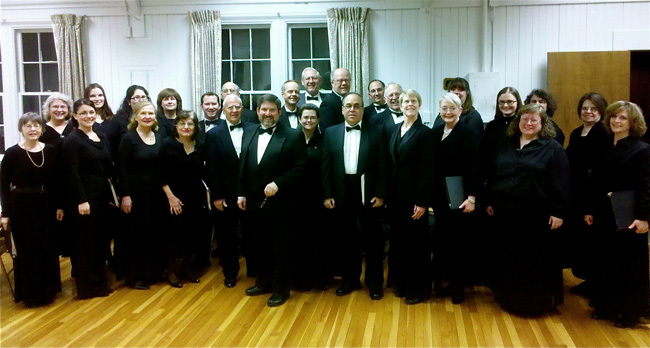 MANCHESTER — “The more, the merrier” is Manchester Symphony Orchestra and Chorale’s plan for its holiday concert on Saturday, Dec. 7, at 7:30 p.m. at St. Mary’s Episcopal Church, 41 Park St.
Kevin Mack, music director of both Manchester Chorale and Pratt & Whitney United Chorus, will be conducting the concert and has chosen a variety of popular seasonal favorites from throughout the ages and all over the world. The program includes traditional carols, with some in exciting new arrangements, including a lilting Celtic Silent Night and a jazzy Deck the Halls in 5/4 time. One of these is a new setting by Bob Chilcott of Christina Rosetti’s poem “In the Bleak Midwinter,” already beloved in its traditional version with music by Gustav Hoist. In the spirit of the season, the musicians have been sharing their talents among themselves to prepare for the concert. Chorale member R’el Rodriguez is one of the singers who have been leading sectional rehearsals, in which singers from one or two sections of the chorus focus on learning their parts. “While playing two parts at once strains my skills as a pianist, it has deepened my musical understanding of the pieces to become familiar with a part that is not my own,” she said. Pratt & Whitney United Chorus member Kathy Baksa assembled practice files for the singers for every piece on the program. She learned how to create the practice files from another Pratt & Whitney United Chorus member. Baksa is inspired by her fellow musicians as the rehearsals progress. “The notes and the harmonies of the songs are beautiful, but when we elevate it with meaning and message, telling the story of each song, I am transformed,” she said. “As we get closer to the performance, it’s quite thrilling to hear the voices and parts beginning to blend and produce beautiful music,” said Ceila Robbins, another Chorale member. The concert will conclude with even more voices joining in the festivities, as the audience joins in a carol sing.